Music of After Coal featured in Southern Spaces online journal. We are honored that a multi-media essay produced by the After Coal team has just been published in Southern Spaces, an interdisciplinary journal about regions, places, and cultures of the US South and their global connections. This title of this short piece, Keep Your Eye Upon The Scale is drawn from the song known as “Miners’ Lifeguard” or “Miners’ Song” a union anthem sung in both Appalachia and Wales. 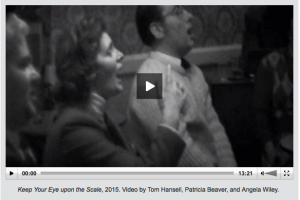 Keep Your Eye Upon The Scale focuses on music collected by After Coal project advisors Helen Lewis, John Gaventa, and Richard Greatrex as they developed a groundbreaking video exchange between the coalfields of central Appalachia and south Wales between 1974 and 1976. Be sure to scroll to the bottom of the webpage for additional music clips from The Strange Creek Singers, Cor Meibion Onllwyn, and Rich Kirby. Many of these musical gems will find their way into the soundtrack of the After Coal documentary.